Where my art and fiber come together. I am getting ready for the show with new items to sell and new demonstrations on the Mirrix Looms so come by and say "Hello". I will have some new Mirrix Looms available for purchase at the show and will be happy to place an order for you as well. The first Fiber Studio newsletter has been sent. If you are a mailing list subscriber (sign up is on the top right corner of the blog) you should receive it soon. If not please check your Spam and put me on your contact list. There are some special offers for mailing list subscribers only! I hope to see you there. 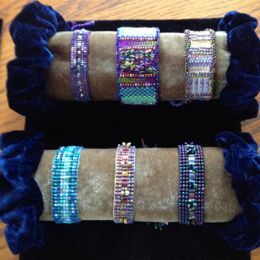 New bead and fiber bracelets at Fiber Christmas, here is a sampling. 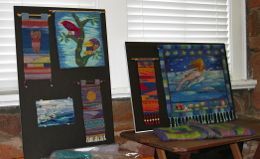 This display has expanded with new tapestry projects on demonstration. 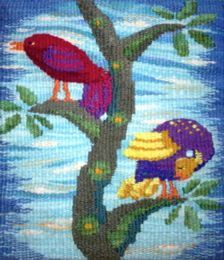 If you want to contact me concerning items for sale from Fiber Studio please email jmeetze8@aol.com. Thank you! 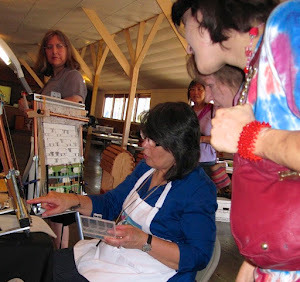 Fiber Studio will be there with Mirrix Looms, tapestries and tapestry weaving supplies and Kumihimo. Come by for a visit. Woven on the Fourth of July!